This luxurious beachfront condo is located in Palma Real, a boutique style condominium in Puerto Morelos. Puerto Morelos is a small peaceful town on Mexico's Caribbean coast, the Riviera Maya. Other than offering some of the most spectacular beaches in the world, the Riviera Maya is home to the great Mayan reef, the second largest reef in the world, only one half of a mile off-shore, making it a Mecca for diving enthusiasts. Located between the charming town of Playa del Carmen and the much more upbeat city of Cancun, Puerto Morelos is a breath of fresh air for those looking to get away to a peaceful haven. In addition to complete relaxation in Puerto Morelos, the surrounding region offers incredible archaeological sites, various eco parks, championship golf and world class shopping. Wake up to the sound of the waves caressing the shores and to gorgeous floor-to-ceiling ocean views, in both bedrooms, of the turquoise Caribbean Sea and its beaches. Another stunning feature of this property is the master bathroom shower and its window overlooking the ocean. 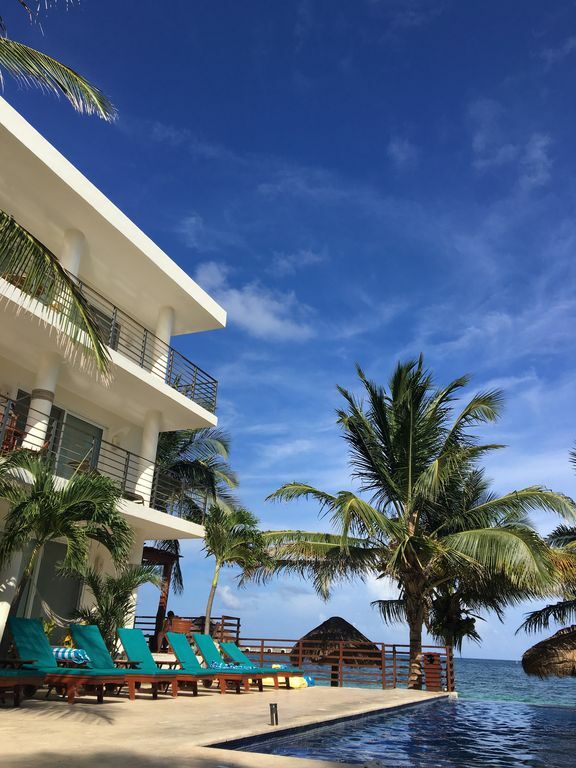 You may choose to lounge on the private second floor balcony, sunbath next to the oceanfront Infinity Pool & Hot Tub, or sleep under the palapas on the beach. This fully equipped condo offers amenities such as High-Speed Wireless Internet (Wi-Fi), Cable TV, and 24-hour Security. In addition, the property has an elevator, making it completely accessible for handicapped and seniors visitors. This condo was recently updated with new granite countertops and tile throughout. Other than being the ultimate getaway, Palma Real is a short 10 minute walk from the charming center of Puerto Morelos where you can enjoy the fine local cuisine, shop, and mingle with the permanent expat crowd who has chosen Puerto Morelos as their Caribbean home. Cancun is 30 minutes north, and Playa del Carmen and the Ferry to Cozumel is 30 minutes south. We have been married for almost 13 years. We reside in Minnesota with our two children ages 8 and 10. Josh owns several businesses and I am a Speech Pathologist. We love to escape Minnesota, especially in the dead of winter. Our children have each been coming to Puerto Morelos since they were 2 months of age. We love the area and we hope to share our slice of heaven with you. We have been coming to Puerto Morelos for over 15 years. We started out visiting Josh's parents every winter at their condo. After having our own children we decided that we wanted our own place to make memories (grandma is just a 1/4 mile down the beach)! It was the view from the master bedroom that sealed the deal for us!! We LOVE our condo! It is a short walk to the center of town. We are just south of the main port so we do not get the walking traffic on our beach. Thus, we feel like we are almost in our own little world at Palma Real condos! It has become our happy place and we love to share our space! Also, the amount of insanely great restaurants in town is unlike anywhere we have found in our travels. Kitchen, Bath and Beach Towels are provided. Secure, Password-Protected High-Speed Wi-Fi Internet Access. Everything you could need to cook a meal! Feel free to take a book from our little free library. We have a box of kids floats, puzzles, and some beach toys. Beach Front Terrace, overlooking the pool and the sea. We just updated our outdoor furniture in 2018. Enjoy a glass of wine on our outdoor sofa complete with cushions or dine on our outdoor table. 2 kayaks in the common area for use by our guests. can be rented in town. Jet Skis can be rented nearby. Boogie boards available upon request. Jacuzzi in pool in common area. The jacuzzi is heated! OPTIONAL SERVICES: Airport Pick-Up & Drop-Off, Grocery Shopping, Arrangement of Car Rental, Mexican Cell Phone Rental, House Cleaning, SORRY - NO SMOKING INSIDE. Beautiful condo and setting! We loved walking to town for dinner and excursions. Very easy to find a good restaurant and there was never a wait. Puerto Morelos is close to everything and we did many day trips including Tulum, a cenote, Xplor, and the Croco Sun Zoo. My husband went on 2 dives and we snorkeled one day. The people could not be nicer. Taxis are very easy to get. We will definitely be back!! GORGEOUS beach condo with floor to ceiling windows! This was one of the best VRBO experiences I've had. Rarely does a rental actually live up to the beautiful pictures on the internet - this one exceeded our expectations! Three of us came here and rented the condo for a quiet week at the beach, and it was absolutely perfect. The infinity pool at the condo was lovely and quiet and felt like having a private pool and beachfront! We loved waking up to the sunrises from the floor-to-ceiling windows in both bedrooms. The only downside is the seaweed that had accumulated on the beach front, but it's been an unusually bad year for seaweed. The beaches in town were a ten or fifteen minute walk away and they are groomed to be seaweed-free. There were a number of "beach clubs" in town where you can pay for beach chairs and umbrellas and order drinks/food, so we also did some beach time in town to enjoy the groomed beaches. Nothing beat coming back to this lovely space after a day visiting ruins or Xel-ha; it is such a quiet oasis amidst the chaos. Love this place and hope to come back! We enjoyed staying here! This home has everything you need while on vacation. It's not too far from downtown Puerto Morelos, only a $2 cab ride. The best part for us was going to sleep at night to the sound of the ocean waves! Beautiful place. Clean, well decorated and gorgeous. Heaven sent n earth. Excellent condo with amazing oceanfront views...very nice pool. This two bedroom oceanfront condo is spacious with outstanding views. Has all the amenities...with a very nice pool and plenty of loungers. Property is well maintained and very secure. We spent two weeks at Palma Real 201 and enjoyed it very much. Well equiped, amazing views and close to everything. The beach in front of the condo is narrow but we enjoyed the tranquility and proximity. The kids liked the endless pool. We also went to the beach in town. We cooked at home most days, my husband buying fresh fish in town. Taxi or by foot or bike, no need for a car (unless you want to travel a lot in the area). Carlos was helpfull and Gustavo took excellent care of the grounds and beach. Dealing with Anna, the owner was very easy. Loved our stay in PM! Very good local restaurants, Great Reef Scuba abd Snorkeling 1/2 mile offshore, Fresh Water Cenote Diving & Snorkeling, Famous Mayans Ruins - Tulum & Chichen Itza, 30 minutes north to Cancun, 30 minutes south to Playa del Carmen & Ferry to Cozumel. Rates are subject to change. A rental is not considered booked until 50% of the rental fee is paid.